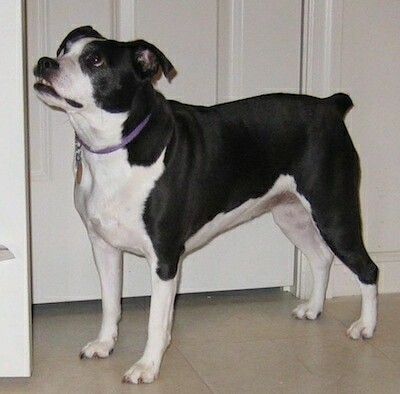 "My dog is a cross between a Boston Terrier and a Jack Russell Terrier. He is very loving and good tempered with tons of energy. He is also extremely smart. He is about 20 pounds full grown. He needs a lot of exercise. He is a great apartment dog. 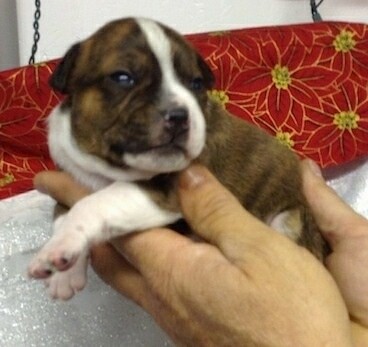 He has a beautiful brindle coat with a white collar and face, similar to his Boston Terrier relatives. He can jump extremely high. Loves agility training. He is a nice slim dog, no weight problems. He has a very shiny shorthair coat and sheds very little. He is not a stinky dog at all. People who come over say he doesn't even smell like a typical dog. He is extremely good-looking and muscular." The Bo-Jack is not a purebred dog. 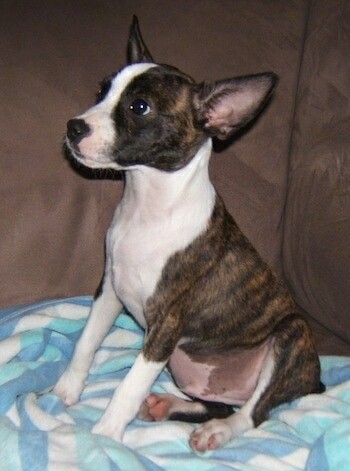 It is a cross between the Boston Terrier and the Jack Russell Terrier. The best way to determine the temperament of a mixed breed is to look up all breeds in the cross and know you can get any combination of any of the characteristics found in either breed. 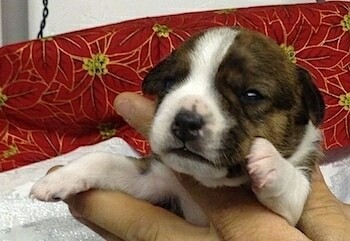 Not all of these designer hybrid dogs being bred are 50% purebred to 50% purebred. It is very common for breeders to breed multi-generation crosses. 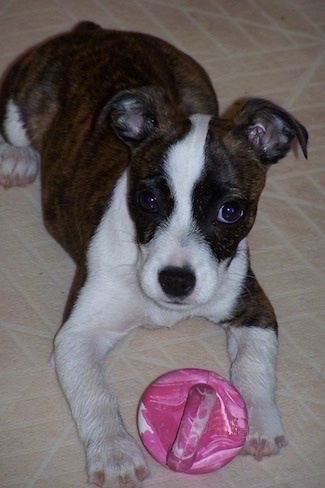 "These are pics I took of our Jack Russell / Boston Terrier mix pup, Jazmin at 3 months old. She is the perfect mix of both breeds. She loves to run, run, run and play with our children and when she is done, she loves to cuddle with anyone who has a lap for her to curl up in. She loves to be near her people. She never gets far away. She is so adorable." 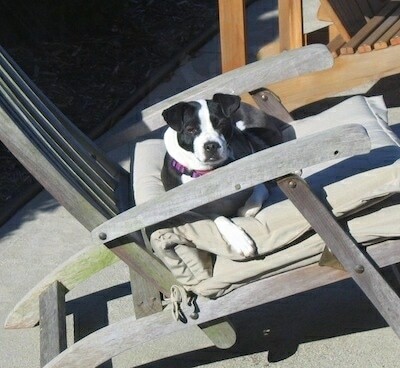 "This is my Jack Russell and Boston Terrier mix named Belle while she was in the process of playing on my nephew's swing set. At that time she was at the top of a slide. She is very active but she also takes the time to sleep and likes to watch some TV shows. Belle was not an easy dog to train and as a matter of fact she is still in the process of trying to get her barking, digging and some other excitable traits she has under control. We are doing this together, but she does have her own mind. She is 1 1/2 years old in this picture, loves most squeaky toys and playing catch, jumps on my lap while I am at the computer and I could swear if she had thumbs she would work the computer. 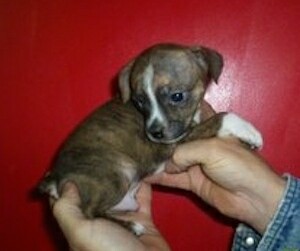 Belle is intelligent but can be hard headed... but she loves to be loved and give love and I am prepared for it!" "This is my dog Molly Moo at 4 years old. 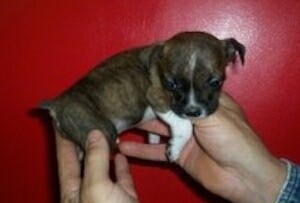 Her mother was a Boston Terrier and her father was a Jack Russell Terrier. We got her when she was one year old from a friend who lives on a farm. 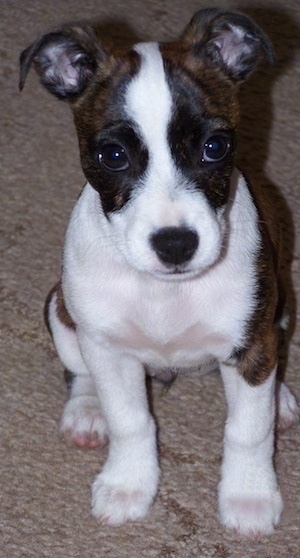 Our friend's Jack Russell had "courted" the neighbor's Boston Terrier and when the litter came out, my friend felt so guilty that he took one of the puppies. As it turned out (to our benefit), they ended up not being able to keep her on their farm because she kept digging under the chicken coop fence and killing chickens. My husband's dog had recently died so the friend asked us if we wanted another dog." "Thus started the love affair between my husband, me and Molly. She is such a fun dog and extremely loving and devoted. Her favorite toy is a knotted rope that I replace monthly due to its destruction. I have to buy the rope that is for a 150-pound dog (Molly is about 28 pounds) because if it's any smaller than that, she will have it shredded within 2 days. Molly hates the rain and barely tolerates snow. She's like a cat as she will seek out a sunbeam in the house and lie in it for hours. Her favorite pastime is to sit on the arm of a chair and just stare out the back door or front window. She watches with great interest whenever a car, person or animal will arrive into her viewing area. She'd be great as a police dog on stakeouts. We had a terrible mole problem in our backyard till we got Molly. She's so effective at capturing moles that my friends want to rent her for the day so she can clear out their yards as well." "Molly is very much a lapdog while we're watching TV in the evenings and her favorite sleeping position is stretched out between the two of us as if she's the hot dog and we're the bun. She actually has a kind of purr that she makes when you are rubbing her and she is really content." "She's got a bit of an under bite so that her two bottom fangs are often showing. She loves to take walks and go for car rides. I try to walk with her several times a week. Despite her breeding, she is actually a very calm dog that rarely barks. But when she does get worked up, watch out, because she takes the game very seriously. Usually at this point she runs to get her rope toy so that she can take out her aggression on it. 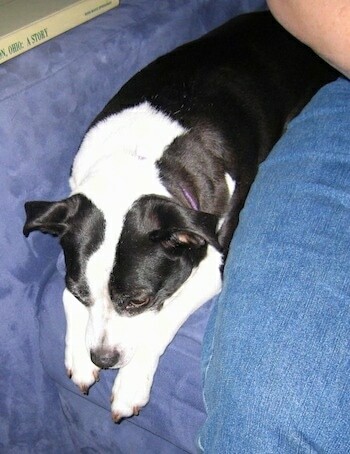 Molly is quite simply a wonderful dog and I can't imagine not having her in our family."